Pianist Nicholas McCarthy dazzled his audience with a series of works for the piano arranged for the left hand only, in a concert held on the 3 of November 2012, during the eleventh edition of Festival Mediterranea. The Sunday Times of Malta of 30 December2012 carries an extensive review by Albert Storace who finds this concert 'impressive'. The entire review is being reproduced below, accompanied by photos of Joe Attard. I stand to be corrected, but I believe that this is the first instance of an entire piano recital composed soley for the left hand taking place in Malta. 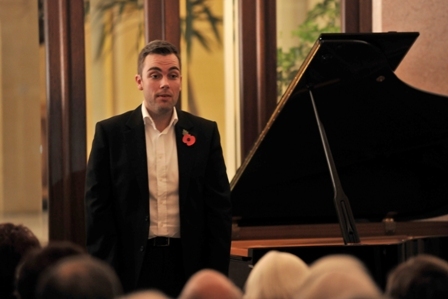 Award-winning British pianist Nicholas McCarthy one of the few left-hand pianists in the world. Certainly impressed his audience at St George’s Basilica, Victoria during a recital that was held as part of this year’s Festival Mediterranea. A certain amount of piano music has been written for the piano entirely for the left hand. Works that were originally written for two hands have also been transcribed for the left hand only and. On this evening’s programme, such skilful arrangements were presented. These tested the performer’s musical technique to the full. In this comments before some of the pieces, McCarthy delved upon the aspects of the work. It was refreshing to see that apart from communicating well through his playing, the musician also addresses his audience with confidence. His comments complemented the notes prepared by Maria Frendo. This young pianist took all the difficult and challenging hurdles the music threw at him in his stride. Whatever he performed, and no matter the style and idiom of the composition, the effect was such tat upon closing one’s eyes it was not difficult to feel that this was music performed by two hands and not one. That much was established in a left hand version of Liszt’s arrangement of Bach’s Fantasie in G minor. When it comes to Fumagalli’s left hand arrangement of Casta Diva from Bellini’s Norma, one sensed a slightly uncharacteristic hesitation in the theme’s first statement, after which the full bel canto nature of the piece flowed very nicely. All the works leading to the brief interval were original works for left hand. First Reinecke’s formidable C minor Sonata, Op. 179 (less the minuet) which was quite a tour de force, followed by the two Skryabin pieces: the rather more energetic Prelude offset by the exquisite Nocturne. These, in turn, contrasted very well with Charbonnet’s piece based on M’appari from Flotow’s Martha, distinguished by the difficult, yet fully delivered ornamentation. The second half opened with an arrangement of an arrangement, the Bach/Gounoud Meditation of Prelude N.1, (or Ave Maria) which had one wonder how could all that was heard so effectively by the work of one hand? 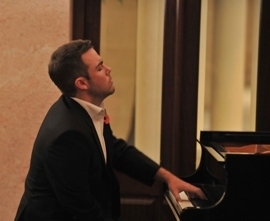 It was, and frankly a new peak was reached when Nicholas McCarthy performed Morgen, Op. 27 N. 4. Applause burst forth after an original work for the left hand was performed. This was Blumenfeld’s Etude in A flat Op. 36 which was projected with richly poetic passion and freshness. Concluding , the pianist chose tow Liszt arrangements, Du Bist Die Ruh was a mix of deeply felt serenity, passion and sensuality. In the darker and more striking Der Erlko, the pianist’s amazing display of stamina and determined energy was nothing but dazzling. A truly great concert.